Still feeling a bit troubled with the start of the season, there is a lot to discuss already. In the offseason, the story was all about RGIII and the recovery from his serious injuries of last season. Operation Patience was the name of his recovery campaign and the news of whether we would see the Rookie of the Year during week 1 waited almost until the start of the game. Preseason could be claimed a success by many measures. While the team did go 4-0, winning the preseason is about confirming the talent and feeling confident about the gameplan going into the season. Kirk Cousins is probably the best young backup QB around and he proved it during his limited time in the preseason. Even Grossman did not look too bad. Pat White solidified himself as a player and a great practice opponent for the defense with his mobility, accuracy and toughness. With the running backs, Helu is definitely a great secondary back, but it was Thompson that impressed during the camps and the final preseason game to become a possible kick returner. The defense looked to be in decent shape with Orakpo and Kerrigan supporting the leadership of Fletcher. New additions Amerson and Rambo looked a bit shaky in their preseason performances, but it was still unclear how they would do in the regular season. It had been talked about that Chip Kelly’s offense was going to use the no huddle, speed design and try to overwhelm defenses. They avoided showing it during the preseason, so Washington was going to get the first look at it without a chance to prepare with game tape. The first several plays were devastating to the Washington defense, but they were bailed out when an errant backwards pass by Vick was taken back for a touchdown. For the rest of the 1st half, the Eagles made the Redskins look like a high school team. Alfred Morris fumbled on his first carry and the Eagles recovered. RGIII was intercepted on the next offensive drive. The Redskins were then plagued by penalties, missed catches and the rustiness of their starting offensive weapons. Included with that was a costly fumbled exchange between Griffin and Morris that led to a safety. The second half did not start out that much better. 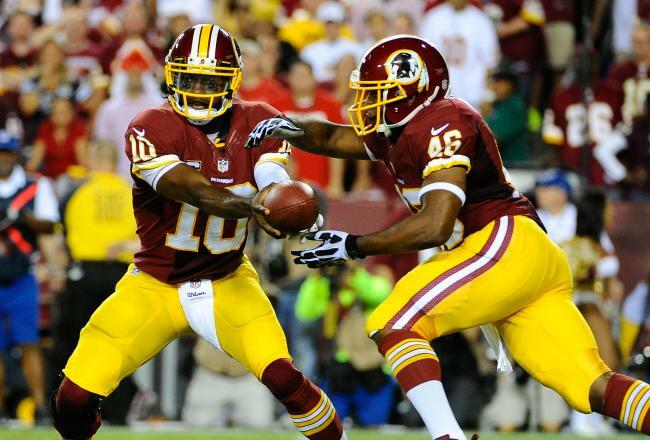 RGIII was intercepted on the first drive and ‘Shady’ McCoy was able to make the Skins pay for the mistake. It seemed like all was lost, but some short yardage completions and good defensive holds allowed Morris to make up for his earlier mistakes and score Washington’s first offensive touchdown of the season. The fourth quarter then turned into the RGIII we had been waiting for. He completed passes to Garcon, Moss and Hankerson. He made up a bit for his 2 costly interceptions with his first touchdown to Hankerson. The defense stepped up for 2 consecutive drives, having finally caught up to Philly offense. They gave up some first downs and longer plays but kept Vick and the offense out of field goal range. Griffin picked up his second touchdown to Hankerson on a beautifully thrown ball over the Philly defense. In the end, the Skins missed their opportunity to get the onside kick with over a minute left on the clock and lost the game by 6. After the slow start, Griffin was able to make up for costly errors and keep the game in contention. Griffin and Hankerson seemed to show a decent connection. The defense caught up to the high octane Philly offense and slowed them down in the second half. Philly exposed the Redskins offense’s rustiness. Griffin and Morris were not prepared and the Philly defense capitalized. Forbath had been automatic last year but missed his first field goal attempt of the season. The defense had to play catchup to a younger and faster overall offense. While the score could have been worse, Philly was able to take large chunks of yards at a time. The offense coughed up the ball 4 times (incl. safety) and only had 2 takeaways. RGIII had 4 INTs all last season and the Eagles ranked last in takeaways. Denver decimated the Ravens behind a record-tieing 7 touchdowns by Peyton Manning. The Patriots barely survived the Bills after Ridley fumbled the ball twice and was immediately benched. Vereen filled in an had a fantastic game but was injured before the game’s conclusion. Peterson had a 3-touchdown performance but fell to Stafford and the strong performance by Reggie Bush (191 total yard & 2 TDs). Pryor’s debut with the Raiders may have been a losing one to the Colts but he put up a real fight to start his career. The Falcons and Saints, as well as the Packers and 49ers, game viewers a sense of what the NFC’s strongest teams are ready to do. Brees outshined Ryan to give Sean Payton a happy return, while Kaepernick’s 4 touchdowns and Boldin’s impressive introduction as a 49er barely lifted them over a threatening Packers team. Russell Wilson avoided a 1st game loss to Cam Newton with a late 4th-quarter touchdown. Alex Smith provided himself to be a great talent as he and the Chiefs’ defense destroyed Jacksonville 28-2. The Giants lost the ball 6 times but only lost to the Cowboys by one score, with Romo’s status still uncertain after taking a double rib shot before the half. 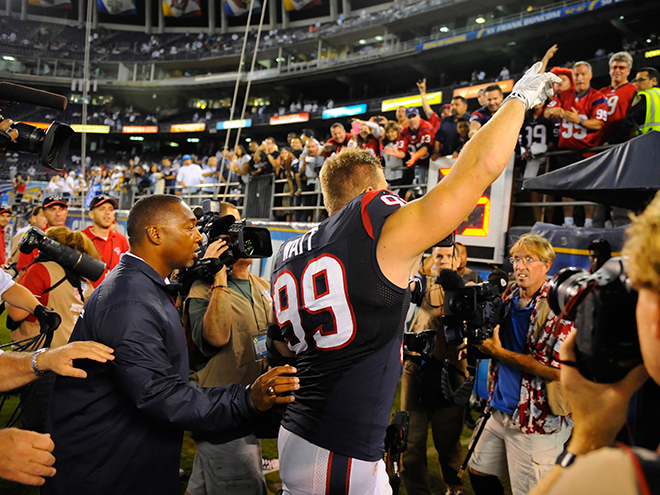 The Texans had an impressive 24-point second half to erase a 21-point deficit and march back against the Chargers.